Blog Free TV Streaming Sites Reviews - An illegal scam? 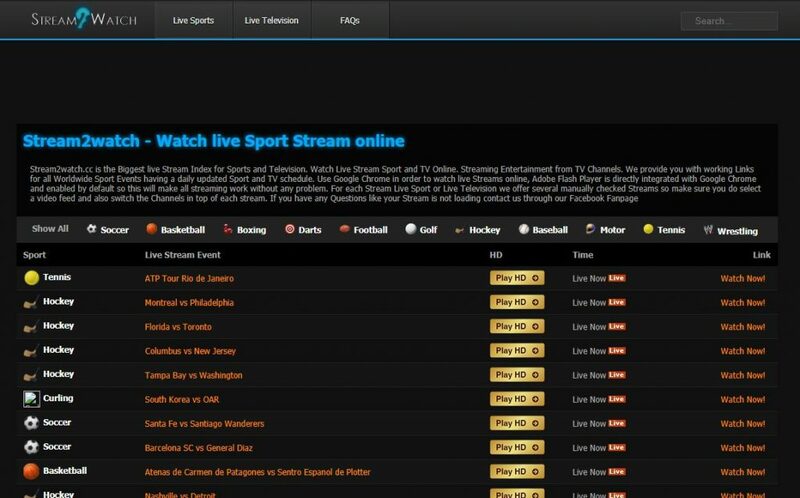 Free TV Streaming Sites Reviews – An illegal scam? 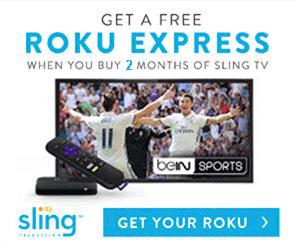 Free TV streaming sites – A scam or not? A lot of times when we post about streaming services or free/cheap cable TV we have to specifically state that the one we are featuring is legal. The term “streaming” has become synonymous with “illegal” streaming sites plaguing the web and convincing unsuspecting viewers to download harmful computer viruses. If you’ve ever searched google for “how to watch _____ online”, “the best way to watch _____ online”, or even “how to cancel cable”, you’ve probably come across multiple sites like these. Before you use any of these sites, please take a look at our Ultimate VPN Guide. A VPN will allow you to browse these sites safely and anonymously to avoid people tracking your location, stealing your information, and to protect you from copyright law suites. We recommend NordVPN as the best available VPN and a link to their discount offer is below if you don’t want to read the full guide. How do I know if a streaming site is legit? These sites come in a variety of designs and layouts, but the principals are the same. Their intention is to offer content (or in some cases only appear to offer content) while bombarding users with popup ads and harmful download links or offering lifetime subscriptions/hardware that give you full access. These sites might offer multiple mirror links to view the site where only some work and others have extremely low quality. Sites like these pop up so often and their domain names change so frequently that it can be difficult to know which ones to avoid. It’s pointless to pretend people won’t use these sites but we’re hoping to create a list of the more popular ones and explain them to our readers. The idea is that we’d rather have our readers understand what they’re getting into and know what to avoid than go in blind if we just created a list of sketchy sites. If one or more streaming sites you use aren’t on our list, feel free to comment below and we can add it. If you’d rather not wait, use Scamadviser as a starting point. Streaming sites and devices are in kind of a grey area of legality. If you look at the URL of most of these sites, you’ll find that they typically have odd extensions. These extensions mean that they are registered to different countries. For example, a website that had a domain of website.ru would be registered in Russia. This is where things get confusing. Typically, a streaming site would be illegal if they were breaking US copyright law. However, why does a site that is registered in Russia have to follow US copyright law? In order to issue a take down notice, the copyright holder has to contact Russia to ask them to take it down. If the domain is registered in Russia but the servers are located in somewhere like the Philippines it can get even more complicated. Another issue making these sites technically not illegal is that most don’t host any content themselves. Usually they are just a library of links and are basically just a search engine to find these links. By having users submit the content, the websites can claim that they don’t support any illegal or copyrighted content being added to the site. Even though it is easy to see that the primary intention of the site is for the illegal copyrighted content, legally speaking it’s hard to prove. So overall the answer is no; most of these sites are not illegal. We aren’t advocating for or against their legality, we just want our readers to be safe. Sites that operate in the legal grey area are more likely to contain harmful content and caution should be maintained when using them. Stream-tv.me has been reclocated to stream-tv8.me. When streaming sites like this change domains, I typically assume it was due to legal issues. With a domain of .me, I’m already cautious of the site. For all I know the domain is registered and run by someone from Montenegro (what .me stands for), but at first glance it’s not a good indicator of trust. The site also has a lot of ads that scream “virus” such as the ones that ask you to download stuff or to register. The site offers brief descriptions of the content, a link to the IMDB page, and a link to view the content. The content page features a lot more untrustworthy ads and plenty of popups when you try and watch the video, but I guess with stream-tv.me, you get what you pay for. A lot of people mention stream2watch for sports and wwe content. As with stream-tv.me, stream2watch.com has recently relocated to stream2watch.cc. This site focuses on the ability to watch sports live, but suffers from the same problems as the others. The site is riddled with ads requesting registration or download and popups to new pages. Some of the links make you suffer through ads and don’t even have any live sports available to stream. Since they are live, sometimes you can watch wwe live but at the same time something like golf might not be available. No availability doesn’t stop the ads or popups though, so make sure you have an adblocker ready! Stream Daddy is a little bit different than some of the other tv streaming websites. Stream Daddy offers a physical product that allows you to stream content. The real question if you’re buying a physical product is “Is Stream Daddy legal?” Based on copyright law, at first glance you would assume Stream Daddy is illegal. Although customers can stream copyrighted content through Stream Daddy, since you’re streaming it and never actually downloading a local copy, it falls into the legal gray area of legality. If you want to stream tv without dealing with low quality streams or annoying popups and ads that could potentially transfer a virus, Stream Daddy or other physical boxes are better than typical streaming sites. I wouldn’t want to invest $100-$200 in a device that could potentially be shut down due to legality, but if you choose to you should be safe…for now. Project free tv is another incredibly popular streaming site. Project free tv curates lists of user uploaded content for shows and movies on sites such as veoh, megavido, and youtube. They skirt the line of legality by claiming users who upload the content should be abiding by the upload site terms of service and not upload illegal content. However, project free tv has a massive database of copyrighted content available to watch. The website layout is better and the site itself has less ads than others, but be careful clicking the links. All of them are full of ads and some trigger downloads while others just create popups. As with other streaming sites, you’re taking a risk visiting project free tv, but the cops probably won’t be busting down your door. Solarmovie has a variety of different domains that all do the same thing. It’s basically a search engine for movies that you can stream or download. There’s a lot of content on the site that won’t cause any issues to your computer, but that’s not true for everything on site. With the rise of popularity of the solarmovies sites, people with malicious intent are more inclined to spend time on it. Popup blockers help, but there are a variety of different types of malware than can infect your computer that don’t get caught by an adblocker. If you must use this site, please refrain from downloading anything. Although streaming the contents is not 100% safe either, it is far more safe than downloads. Solarmovie has a report button on all of their videos and hope that the community can flag anything that is unsafe or suspect. It can help you keep an eye on the amount of views something has and to avoid anything with a low number. At least you’ll know a large number of other people have also streamed the content and can rest a little easier that you might be okay. Alluc is a little bit different than most of the others. It’s layout is incredibly basic compared to the rest and it’s functionality is far less intuitive. It’s homepage looks more like Google’s and offers no categories, images, or recommendations to click on. It operates as a search engine and uses search functions such as “movie trailer Host: Youtube.com #newlinks” to help refine searches. If you don’t mess around with it for a while, it can be difficult to navigate and increase the likelihood that you click on something dangerous. For example, we searched for the new movie “Winchester” by typing exactly that into the search bar. Immediately 12 popups were blocked and were shown this page. 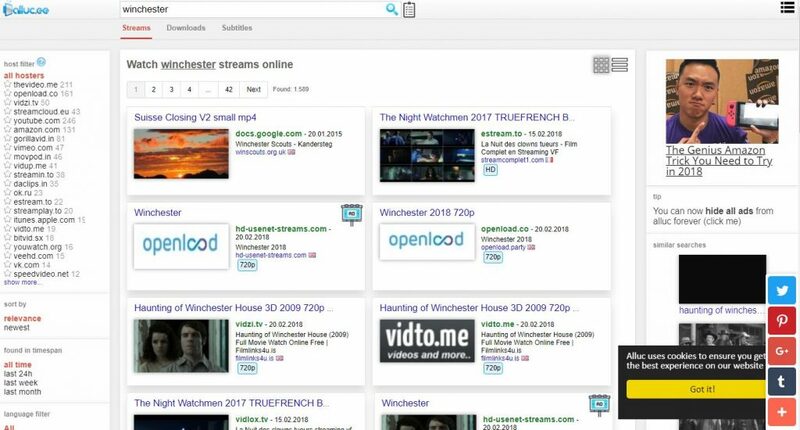 The site found over 1,500 different links that will show some version of “Winchester” from hundreds of different sites. Without user information such as views or rating, it’s almost impossible to know which of these links are high quality and what one’s are malicious. You can refine the search on the left, but it doesn’t get much better from there. We advise staying away from Alluc if you’re not already familiar with the interface or are confident in your computer and network’s security. Icefilms (now icefilmsinfo) is another popular movie and TV show database that streams directly on the site. It allows you to organize your searches by Movie or TV Series, Genre, Years, Featured, or by Top IMDB. It also has a feature that lets you search by country to find movies local to that nation. One good thing about Icefilmsinfo is that each video shows you the amount of views it has. Sites that display this information make it a lot easier to distinguish between decent or sketchy videos. Try and stay away from low views on a video, even if it’s a new film. Icefilms makes it a point to feature movies that are currently in theaters and displays them front and center on the site. Each film can be watched through two different platforms on the site, OpenLoad and Streamago, and both play in the browser. Compared to some of the other streaming options, Icefilmsinfo was rather tame in terms of pop-ups blocked by our ad-blocker with only one or two blocked each page. However, every time you try and click the play button on a video you’ll get a pop up so be warned. We also recommend not trying to download any videos on the site since you’ll just be asking for trouble. Movie4k is one of the lower quality movie databases that we’ve seen. Some of the free TV or movie sites are really well made, visually pleasing, and have an incredible user interface. Movie4k is almost the complete opposite of that. It’s one of the first movie databases whose design constantly reminds you that the content is less than legal. It’s slow, twitchy, barren, and pretty confusing. All of their movie links look like cheap ads and all pop up external windows from a different website. They do have download links, but like most of these sites, we’d recommend avoiding them. The top bar has links for Free TV Shows and Free Live TV that leads to other sites that we’ve explained in this guide. They also have a disclaimer and DMCA page that explain how they don’t condone illegal content. It’s worth a read if you’re still confused about how these sites can operate in a legal grey area. We don’t recommend using Movie4k at all though. If you’re going to use a legally questionable site, at least use one that’s halfway decently made. We’ll continue updating this list as users ask about sites or we come across them. If you have a question about a certain site, comment it below as text, not a link please.